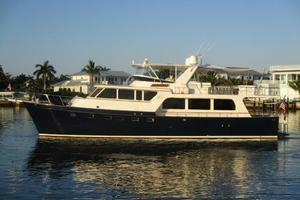 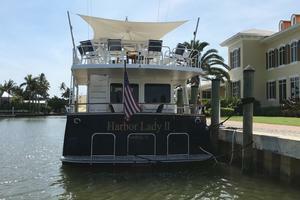 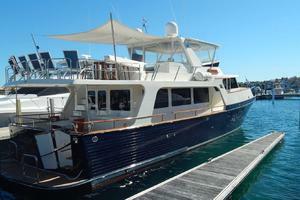 Harbor Lady II is a very special Marlow 65 Explorer with spaces similar to a 70E Marlow with Euro transom. 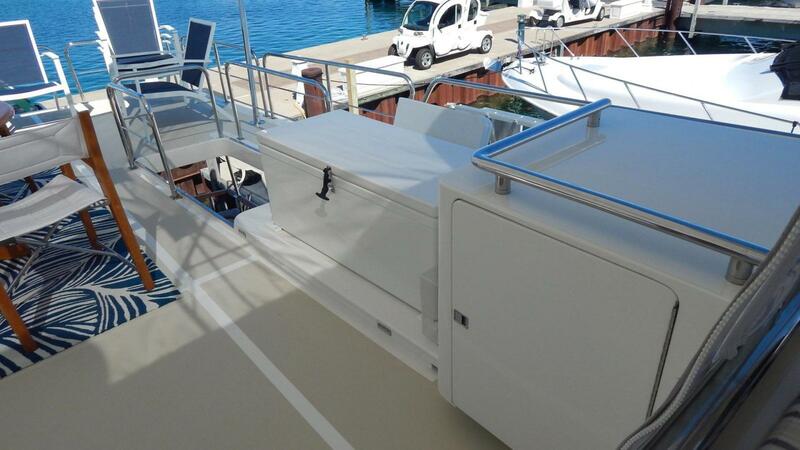 Swim platform access from a floating dock is better on the 65C model like Harbor Lady II. 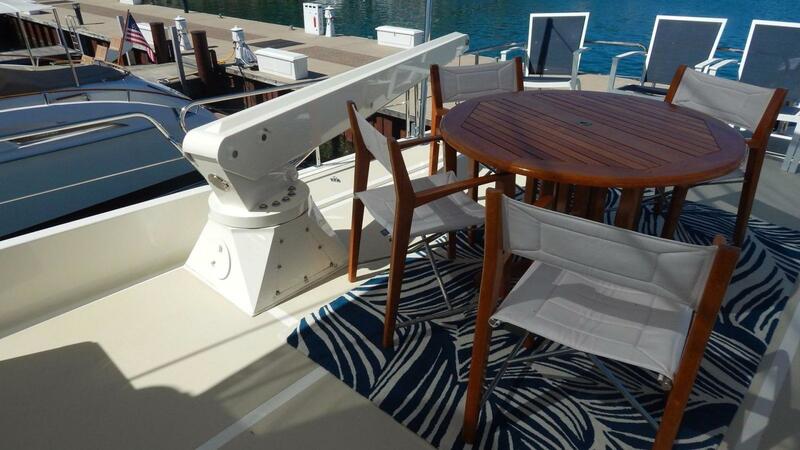 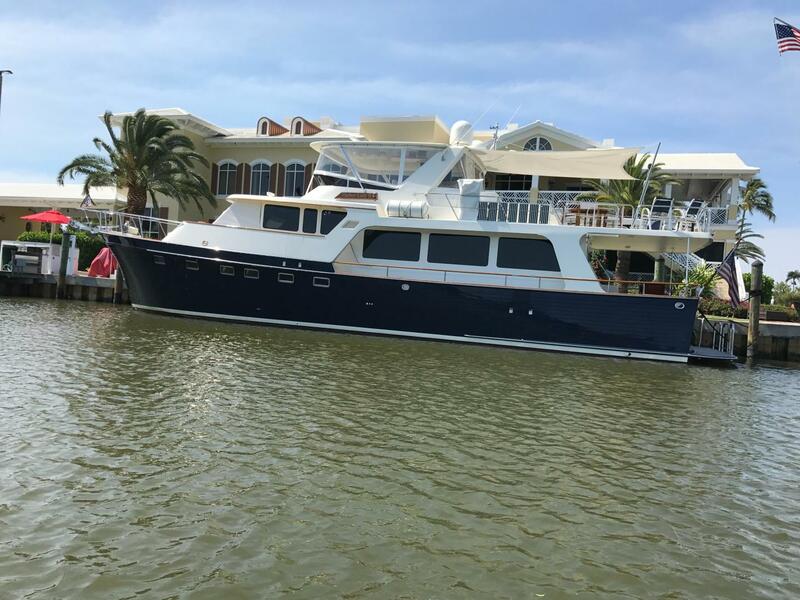 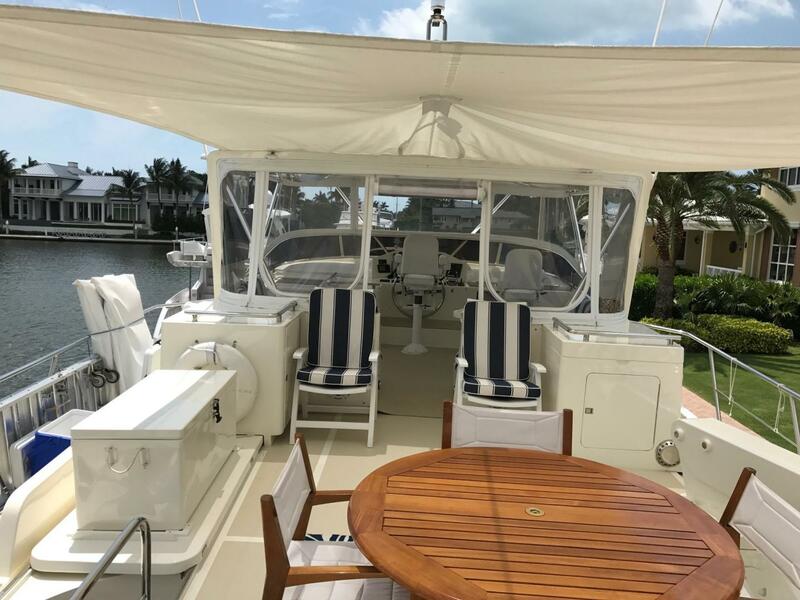 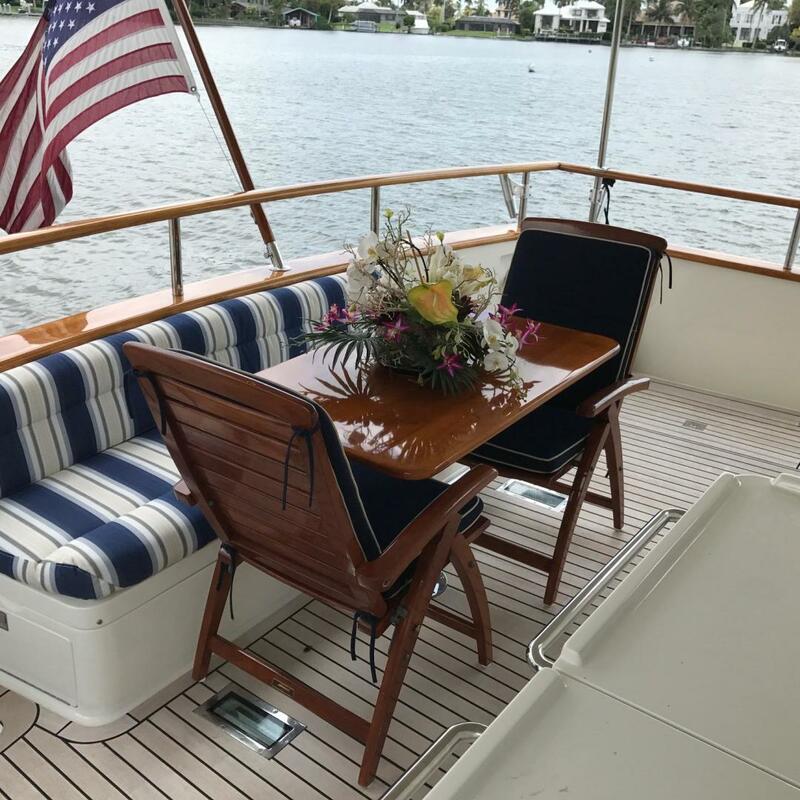 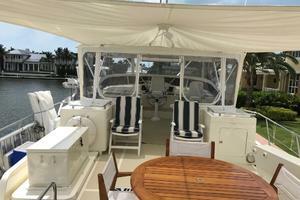 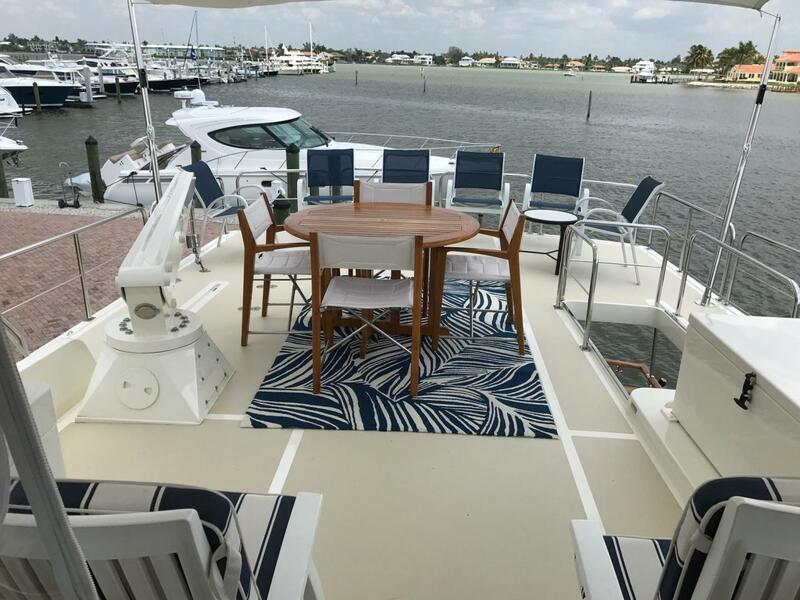 The boat deck on Harbor Lady II has been extended over the aft deck seating creating a larger veranda above with full railings used for entertaining, yet chocks can still be fitted and a dinghy installed as desired. 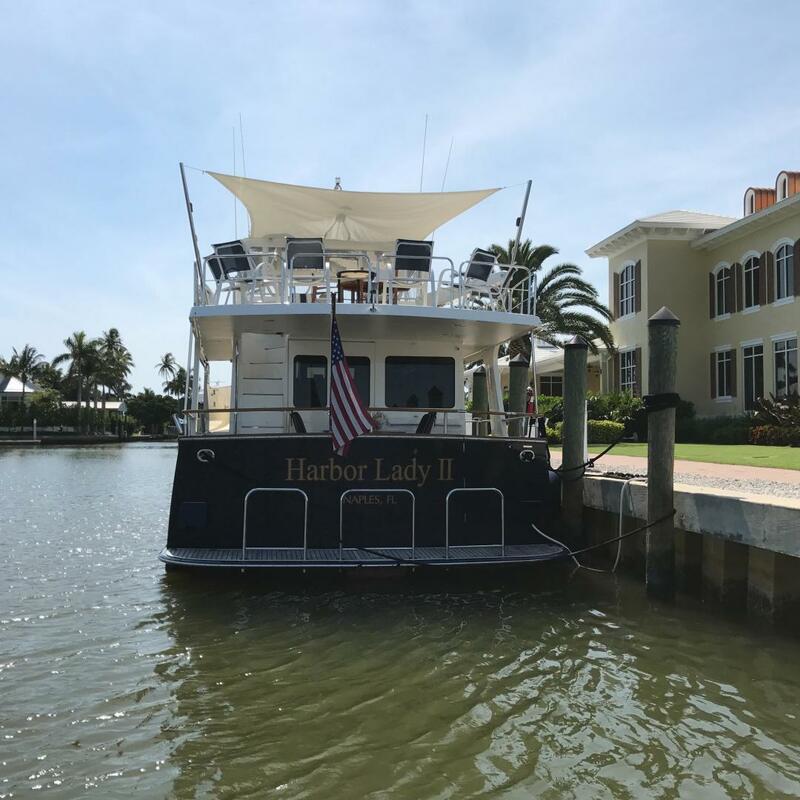 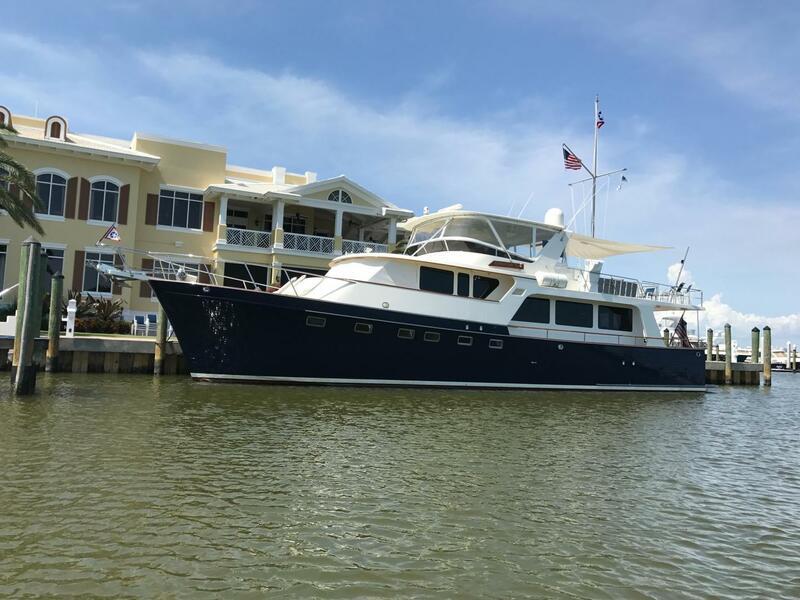 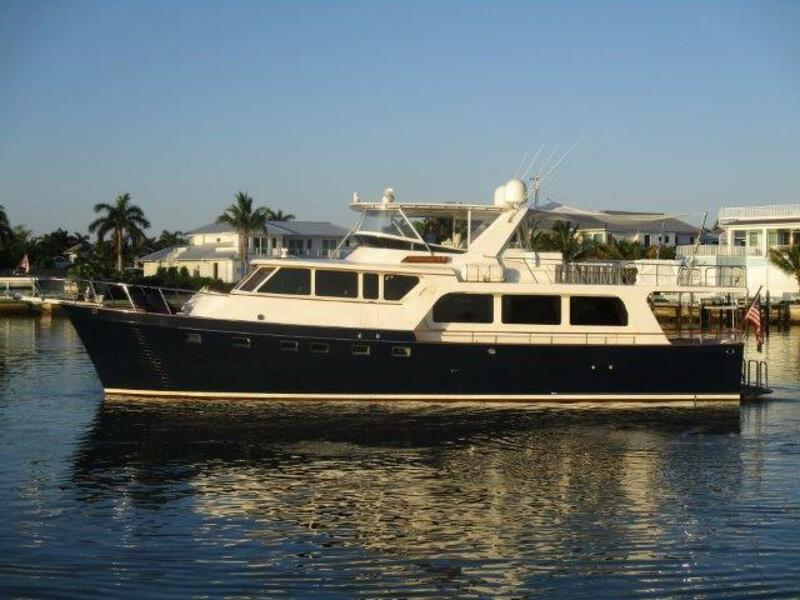 Harbor Lady II is 74' from bow to end of the swim platform and has the feel of a much larger yacht due to it's high ceilings and open floor plan. 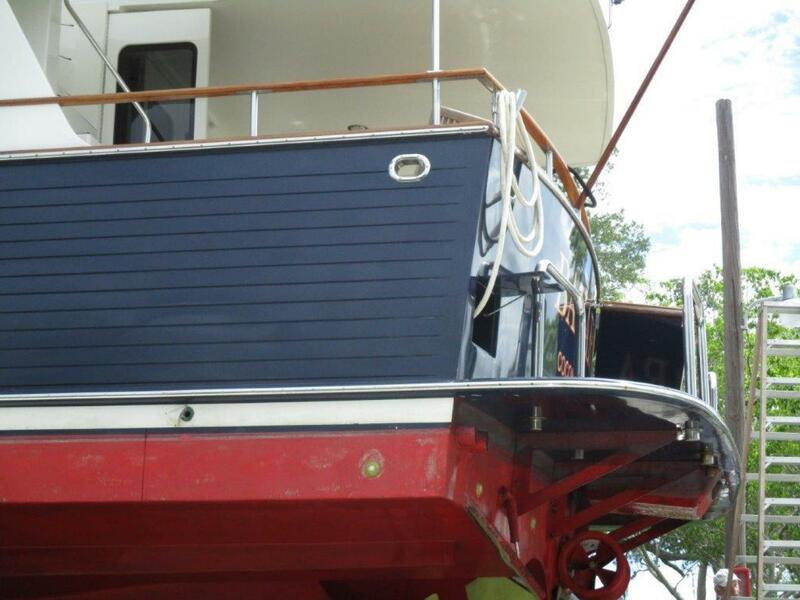 Aesthetically the roof extension lines up well with the traditional non raked transom and looks like the boat was originally built that way. 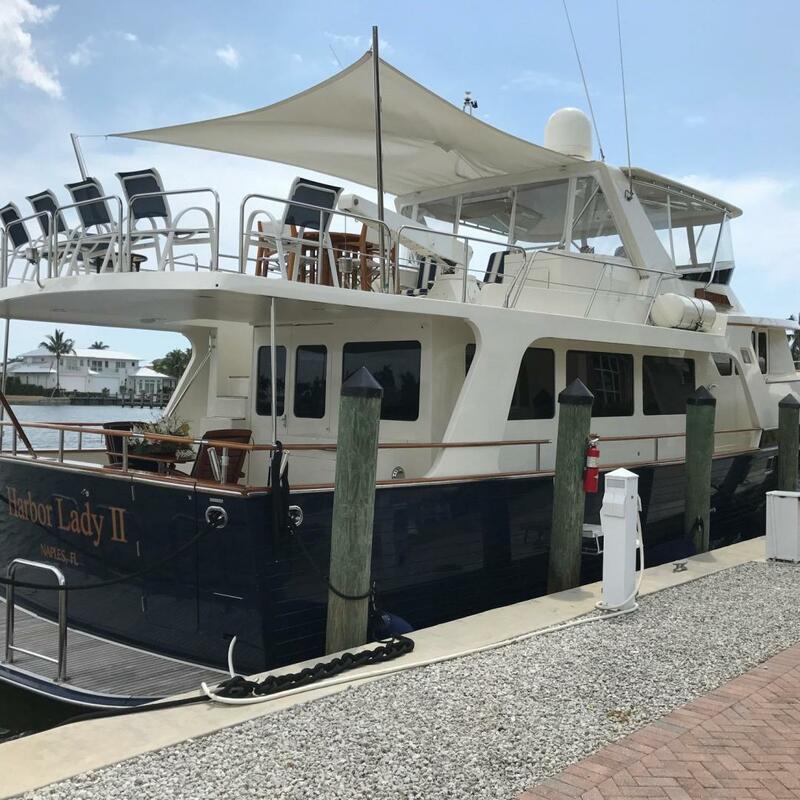 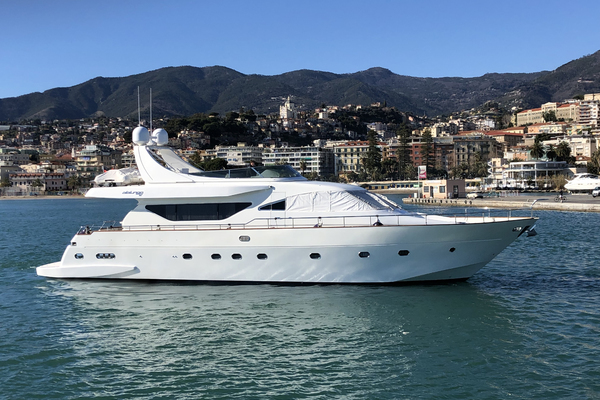 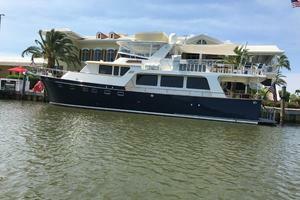 On the main deck Harbor Lady II has a large pilothouse with dining settee and open galley and doors on each side to walkaround side decks and stairs to the flybridge and forward steps to the guest staterooms. 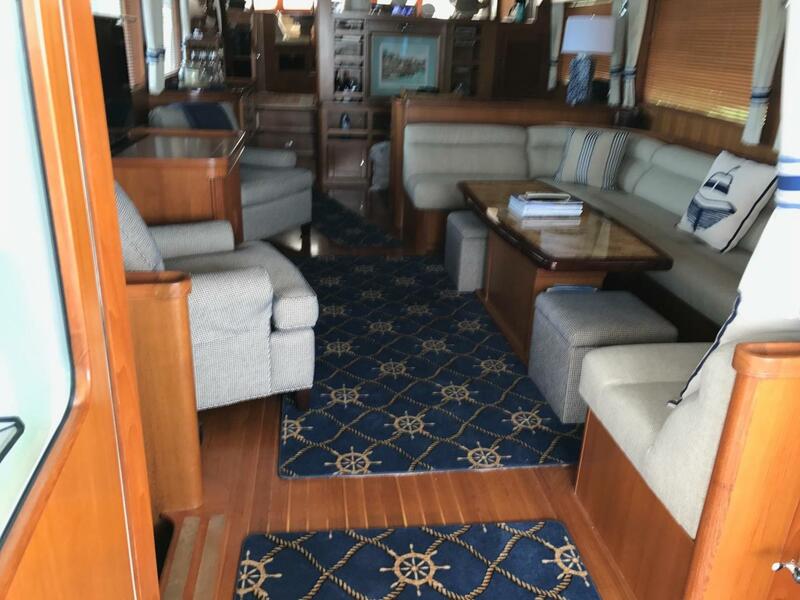 Aft of the pilothouse is the main salon with large windows, comfortable "built in" seating, and a private staircase to the master stateroom. 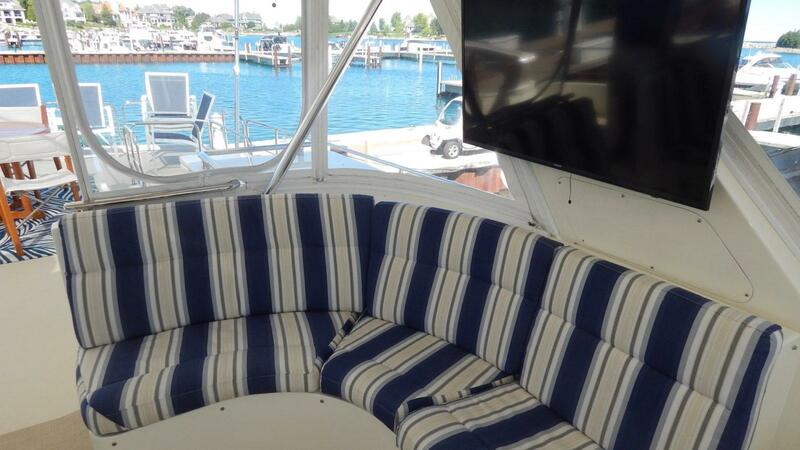 Below deck is a Queen bed V.I.P. 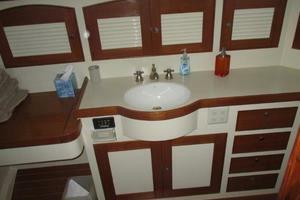 stateroom forward with ensuite head and shower. 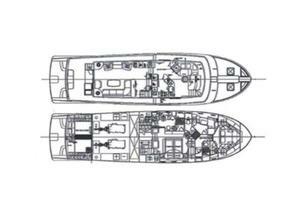 On the portside there is a crisscross stateroom with two single beds with ensuite head and shower, all the way aft is a spacious master stateroom. 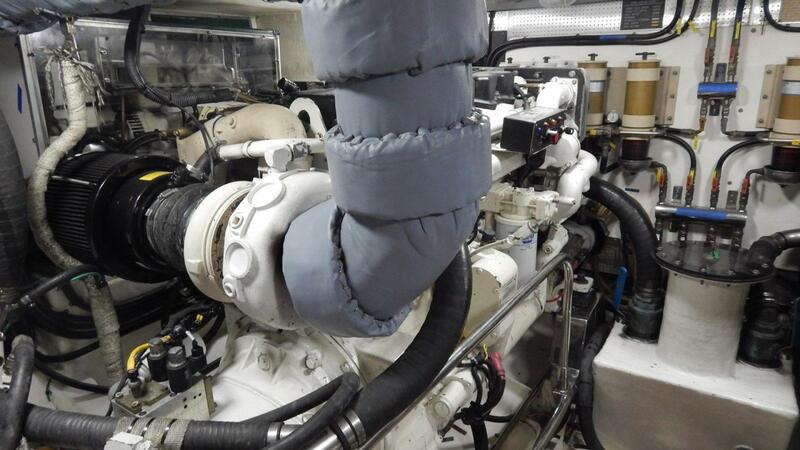 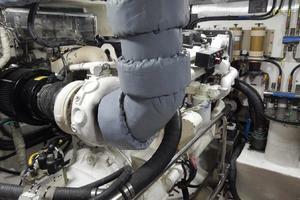 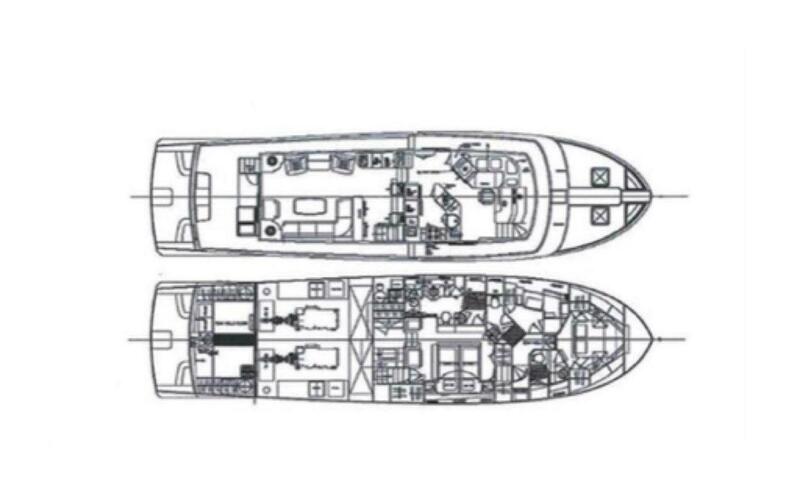 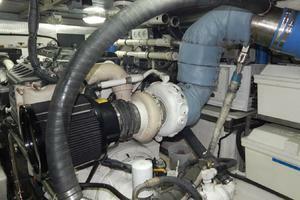 Aft of the stateroom area, separated by hull to deck fuel tanks is the engine room and crew quarters. 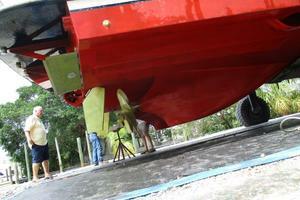 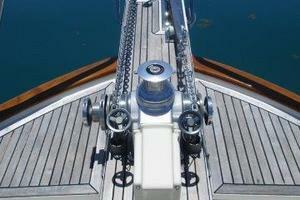 Marlow are very solidly built yachts with large molds for component parts providing a very solid feel underway. 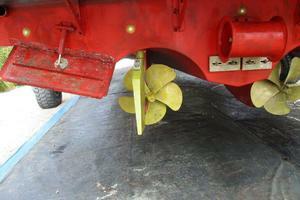 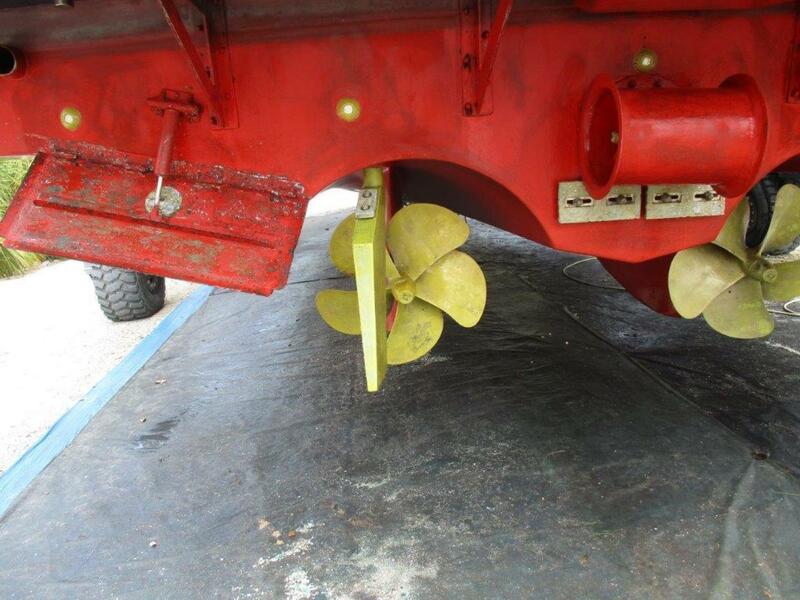 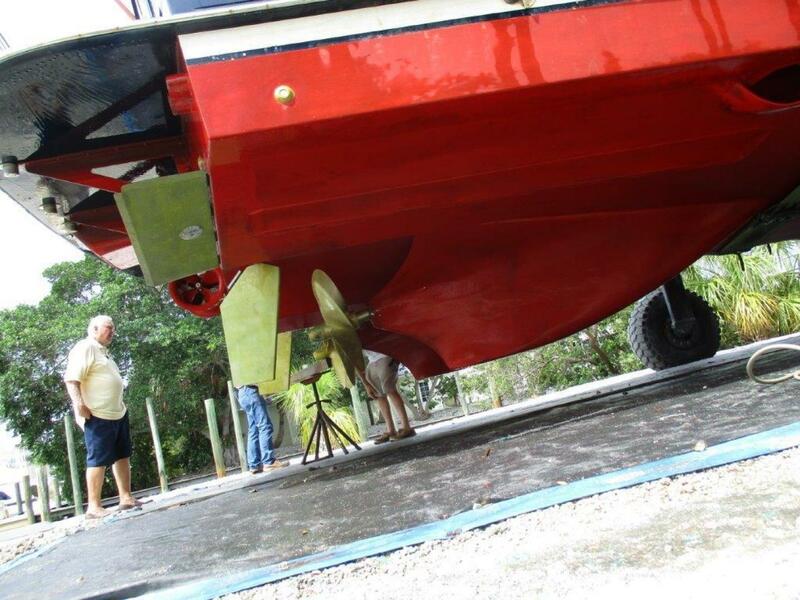 Marlow also utilize a velocijet keel/tunnel system that improves propeller protection and provides shallow draft. 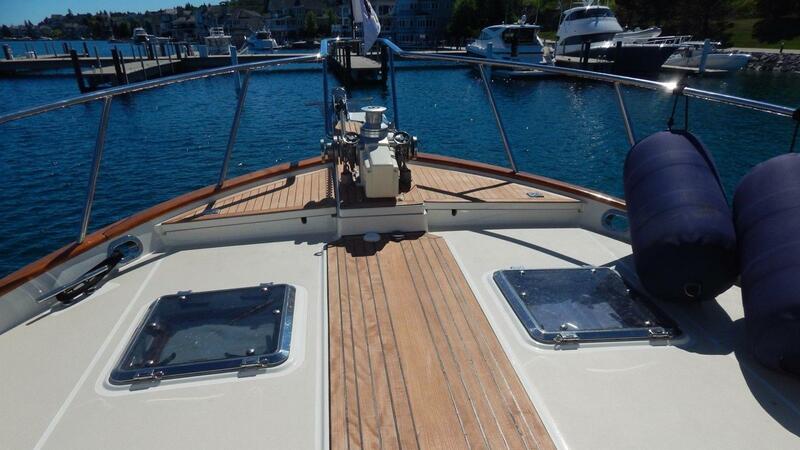 The Marlow hull is semi displacement and preforms very economically between 8 and 12 knots. 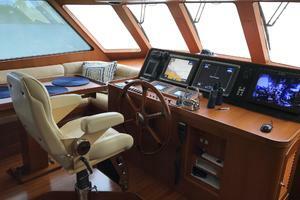 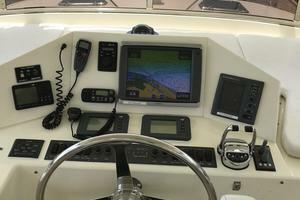 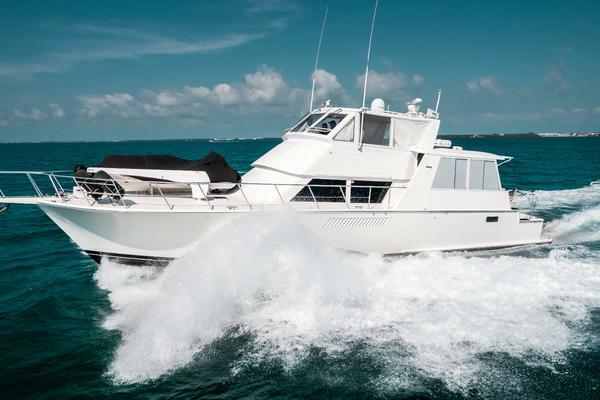 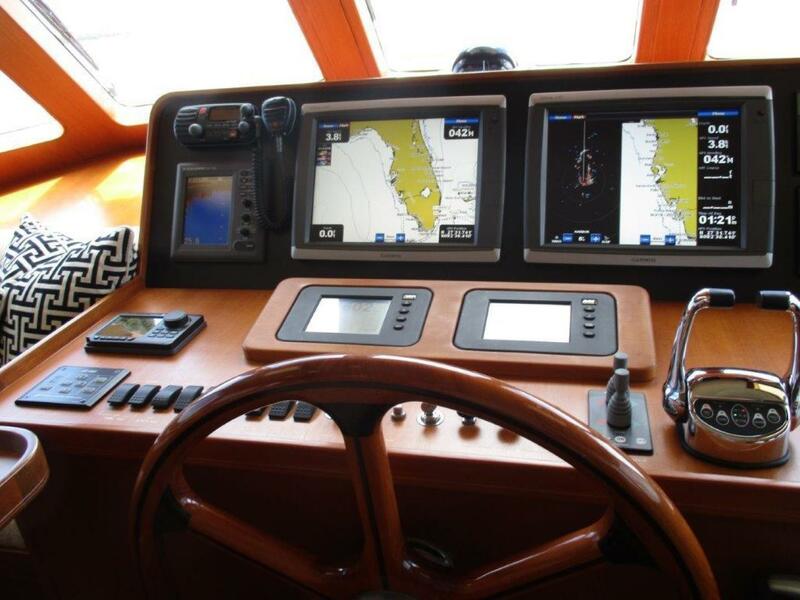 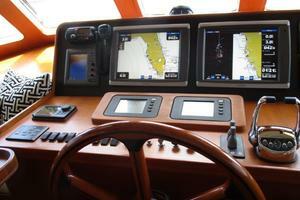 She can also outrun bad weather at close to 20 knots when needed and loves deep water swells. 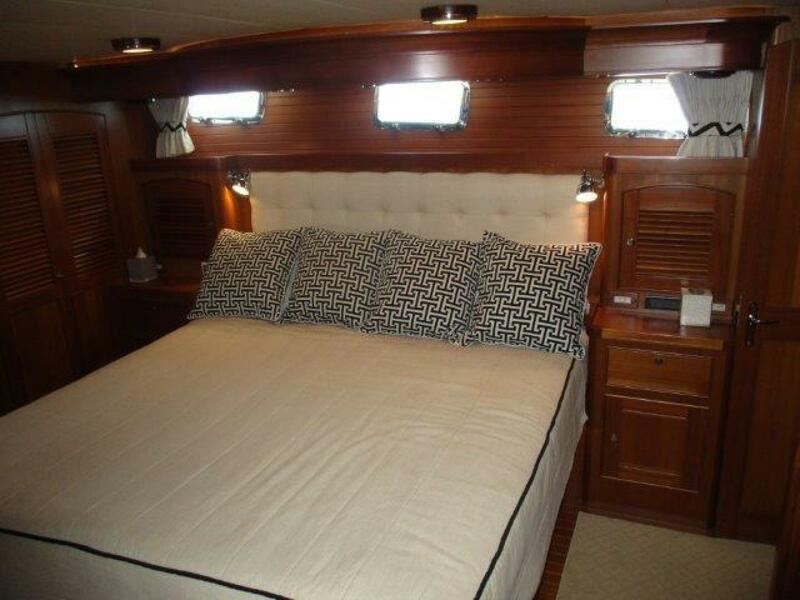 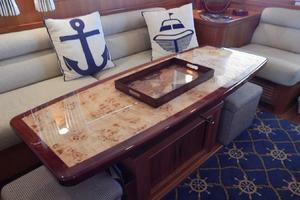 Harbor Lady II's Master Stateroom runs full width, making it very roomy. 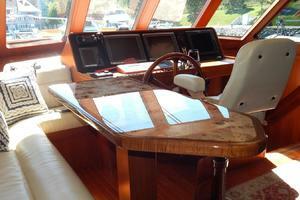 Her carpentry in the master suite is Burmese teak. 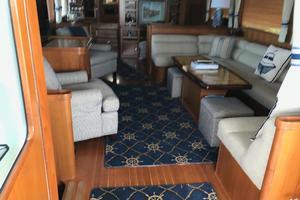 She carries an island king berth with four drawers under the berth in addition to two dressers and three full-size closets. 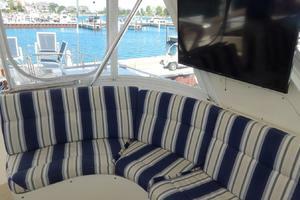 There are portlights with screens, night lighting around the berth as well as behind valances. 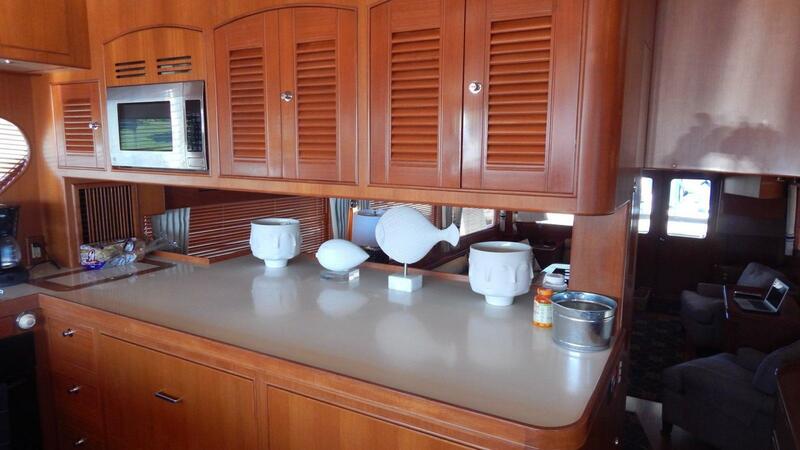 Lighting fixtures are 24V Italian and Danish, giving the stateroom a very comfortable atmosphere. 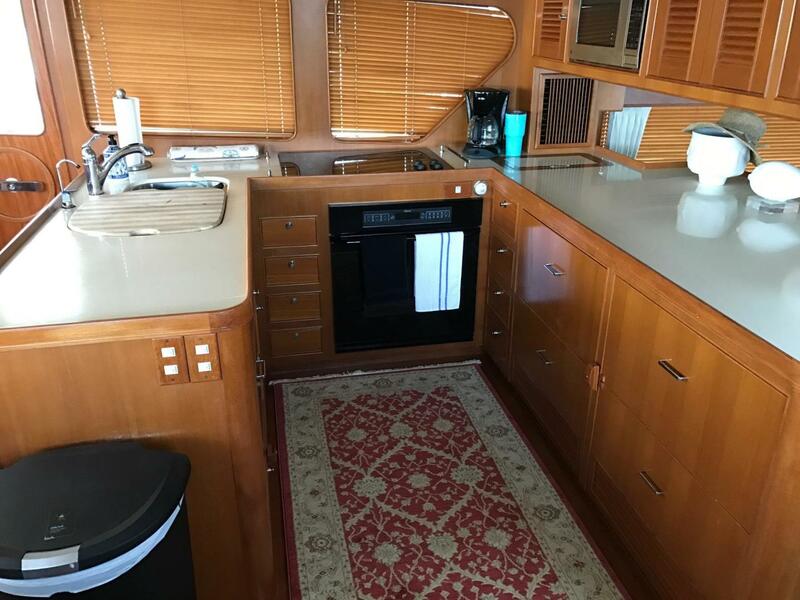 On the aft side of the stateroom, down two steps, is the laundry area with washer and dryer behind louvered wood doors and several drawers for storage. 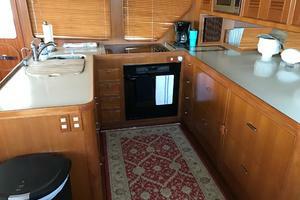 The ensuite head is spacious with vanity with white granite counters and several drawers and lockers with shelves for storage of toiletries, linens, etc. 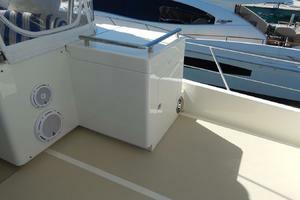 The enclosed tub/shower allows the flexibility to pamper yourself. 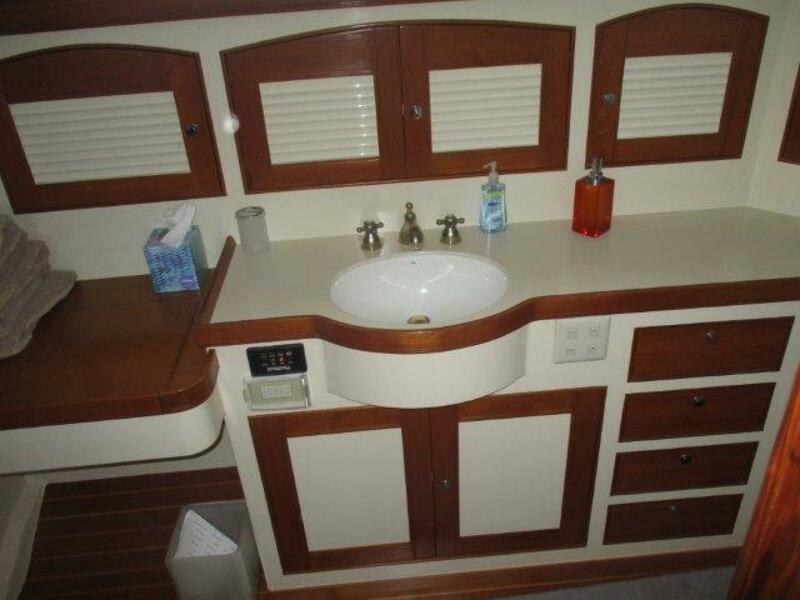 There is a shower room with teak grate, mirror, ceramic sink with white corian counters and Grohe faucet and additional storage. 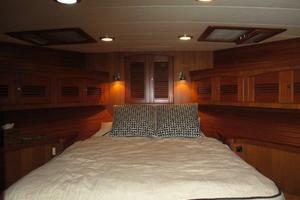 The VIP stateroom is very spacious and bright with teak carpentry and ensuite head with stall shower. 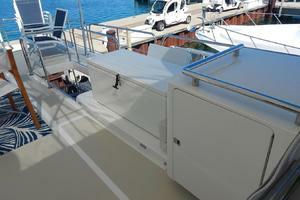 A queen island berth has two large Manship hatches and under berth storage in addition to two cedar lined hanging lockers. 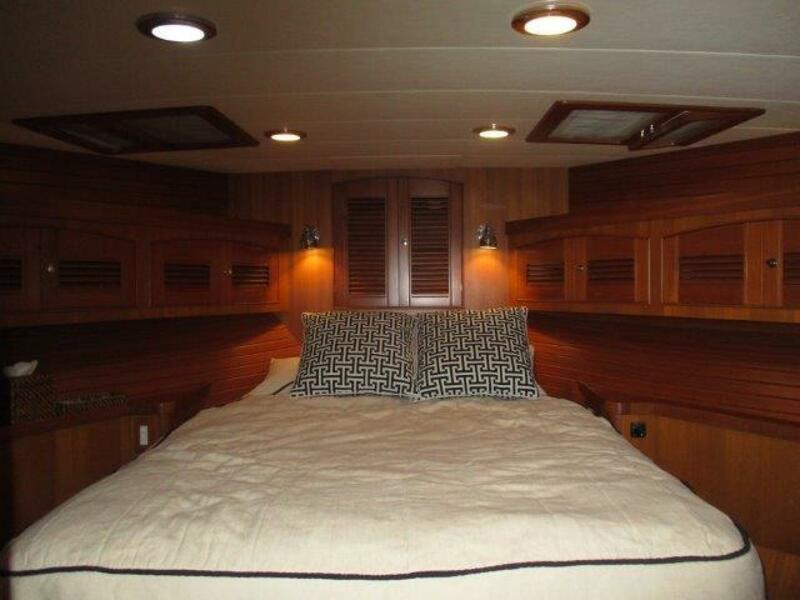 There is a TV, DVR, telephone jack, intercom telephone and above berth reading lights. 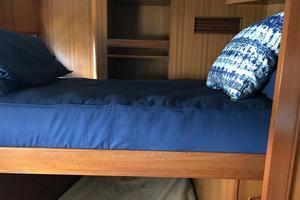 There is a full head with separate stall shower accessible from the stateroom or the companionway to allow use as a day head. 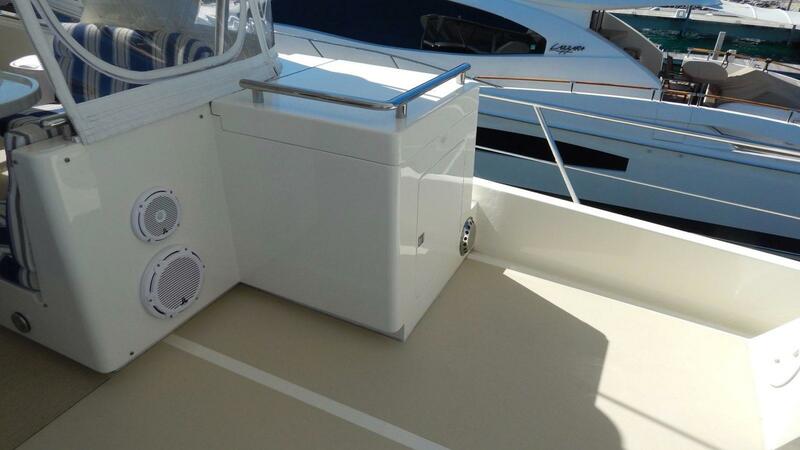 Outboard of the shower is a large linen locker. 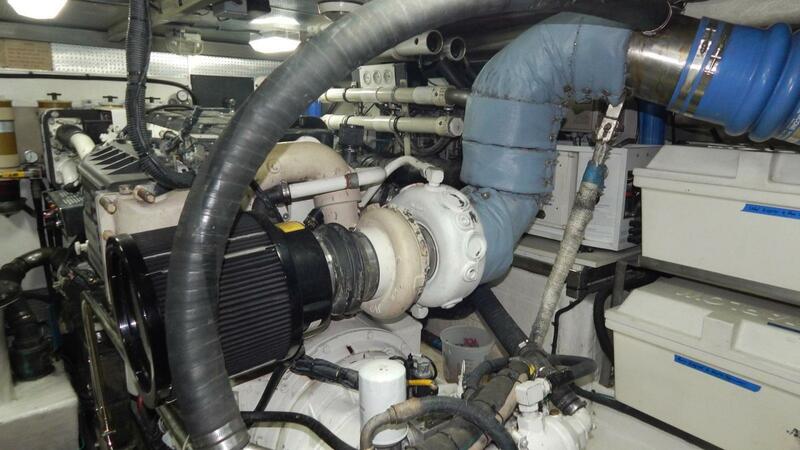 Both the head and the shower have exhaust fans vented outside the vessel. 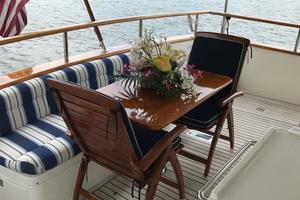 The VIP head is a comfortable size and has a large dedicated shower with a teak grate. 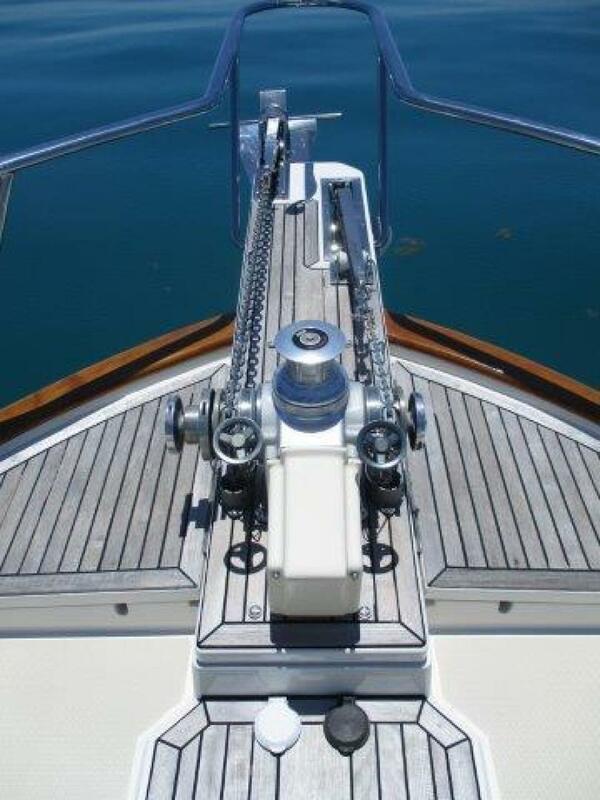 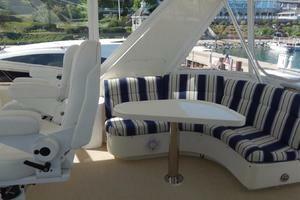 The head can be accessed from VIP cabin or the companionway to act as a day head. 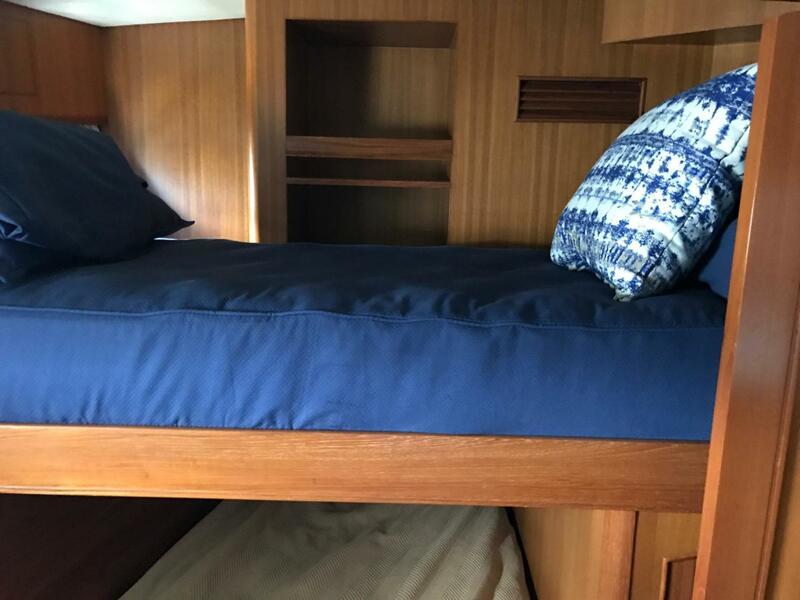 The portside guest stateroom has over/under berths and cedar lined hanging lockers. 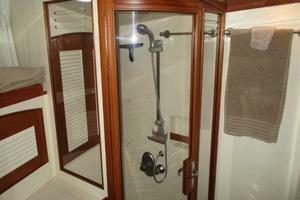 The guest stateroom has a private head with shower and vanity. 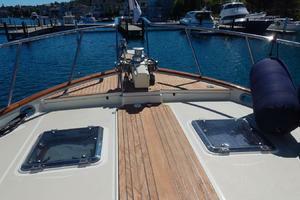 There is another cedar- lined hanging locker to starboard just inside the door to the companionway. 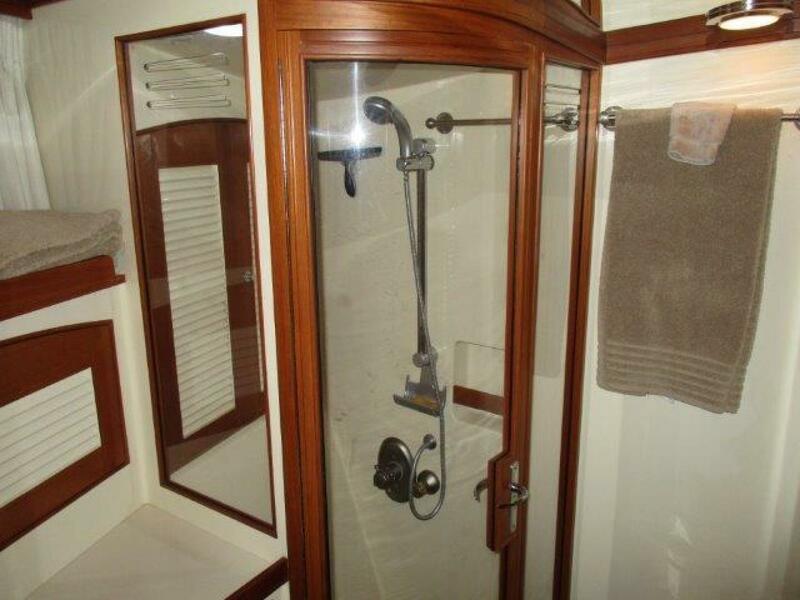 The Guest head / shower combination with a teak grate. 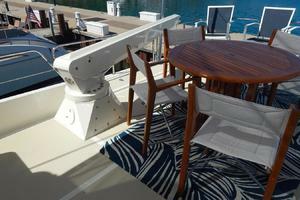 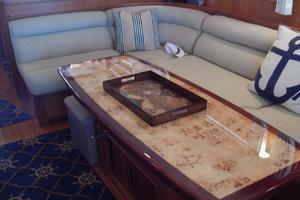 The head can be accessed from the VIP cabin or the companionway to act as a day head. 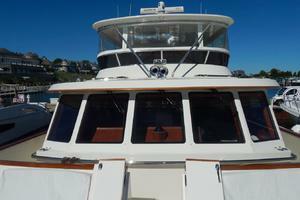 Up three steps from the salon to the galley is the pilothouse. 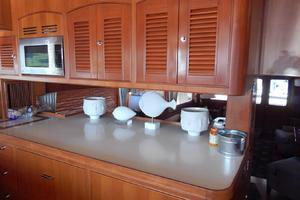 The galley is very well-equipped with top of the line appliances and plenty of storage for provisions and cookwares. 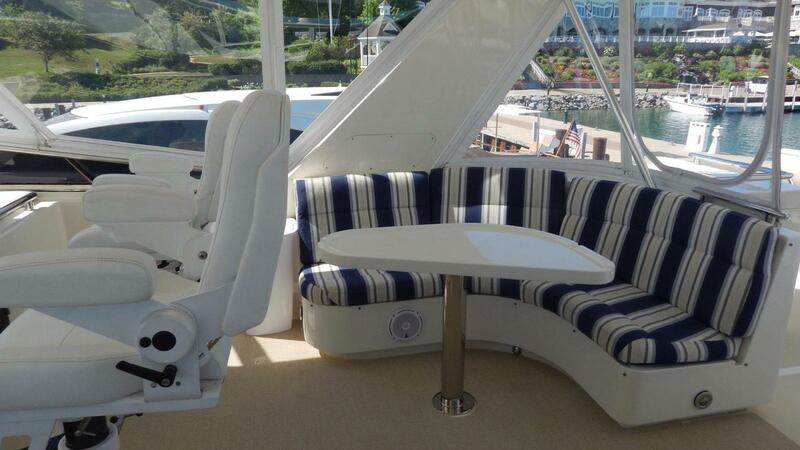 It is U-shaped with beautiful corian countertop creating a lovely setting for entertaining guests in the pilothouse, or communicating with people in the main salon. 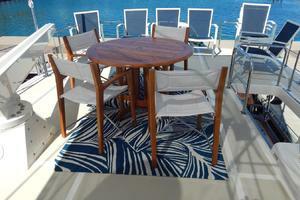 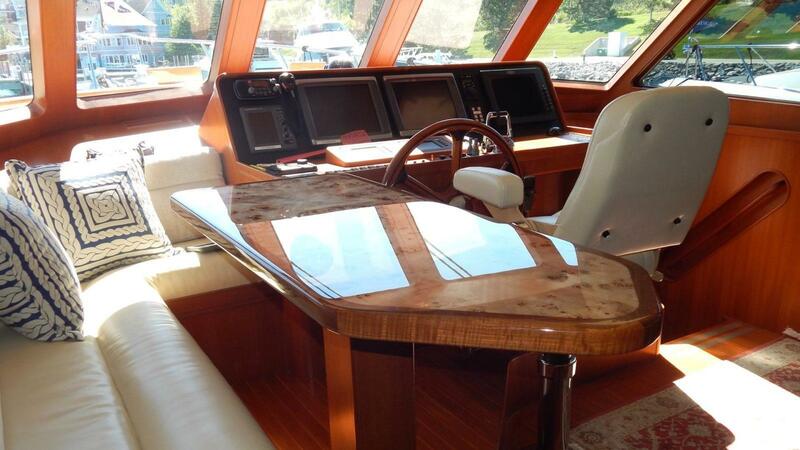 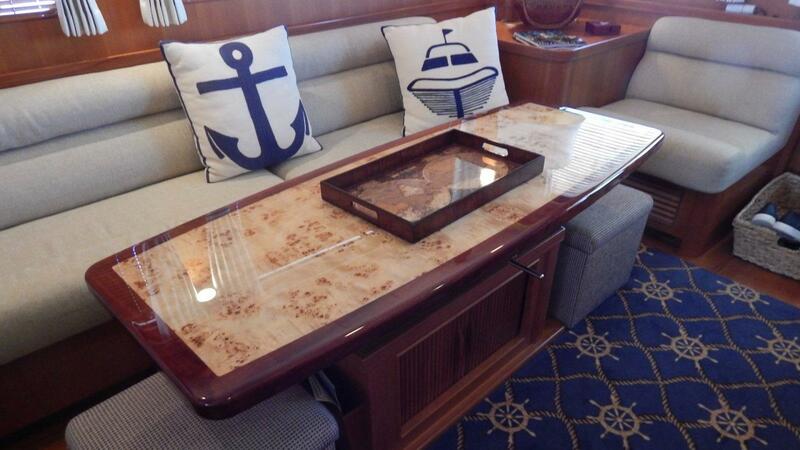 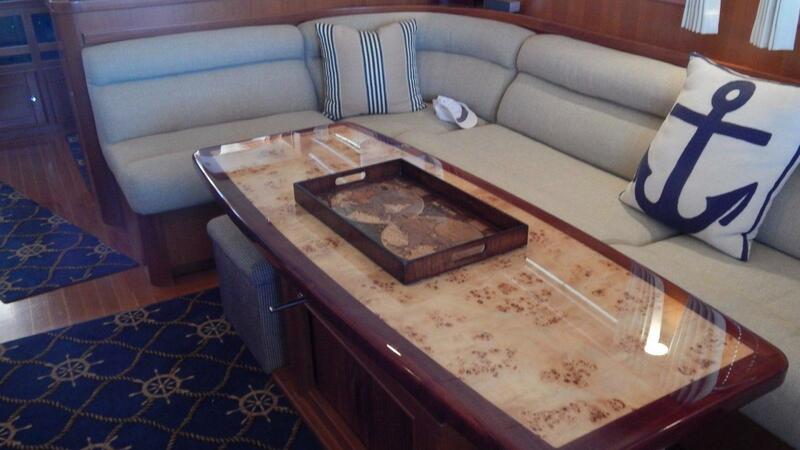 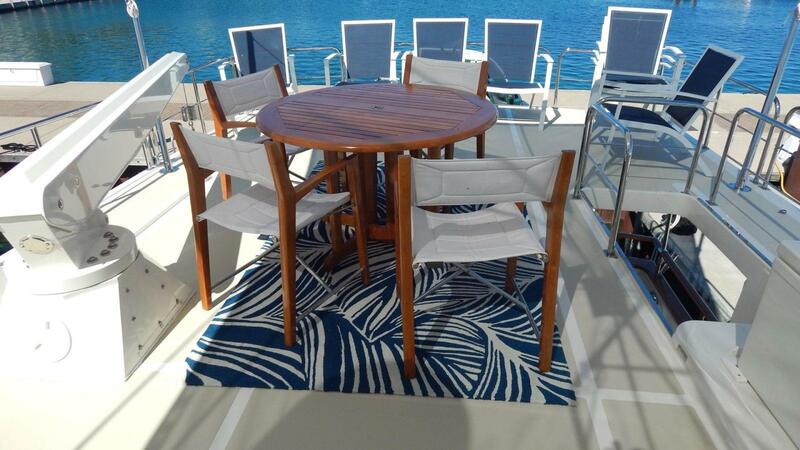 The wheelhouse is another very comfortable area, complete with Stidd helm chair for the captain next to a gorgeous teak dinette with Ultraleather seating for guests. 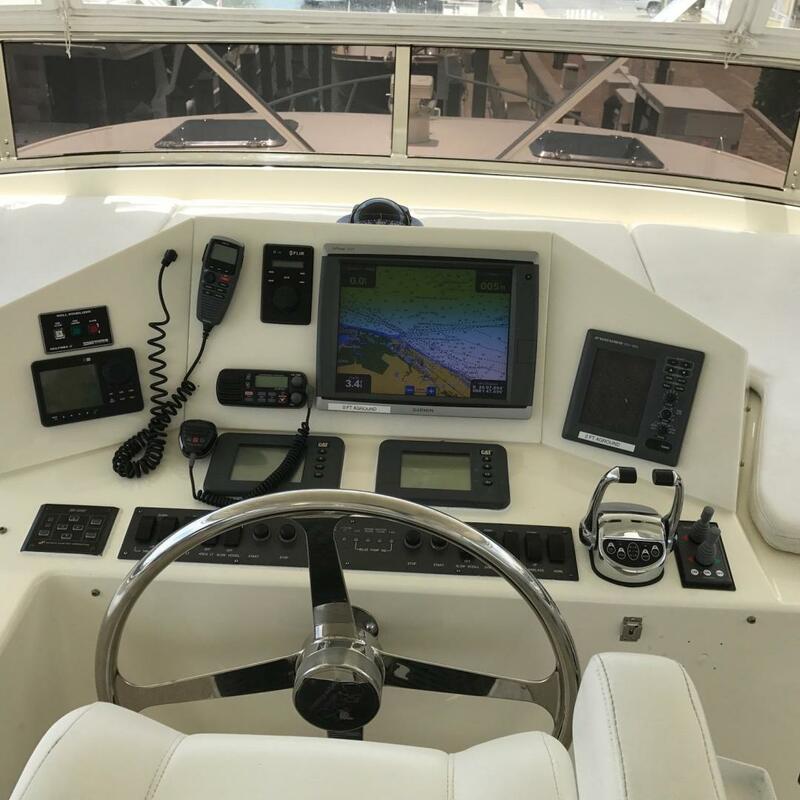 The overhead panel has electronics, breakers, NAIAD stabilizer controls, inverter/charger controls, tank tender and the vessel control center. 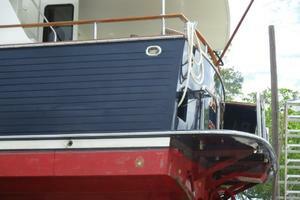 There are sliding doors port and starboard to the sidedecks and Portuguese bridge. 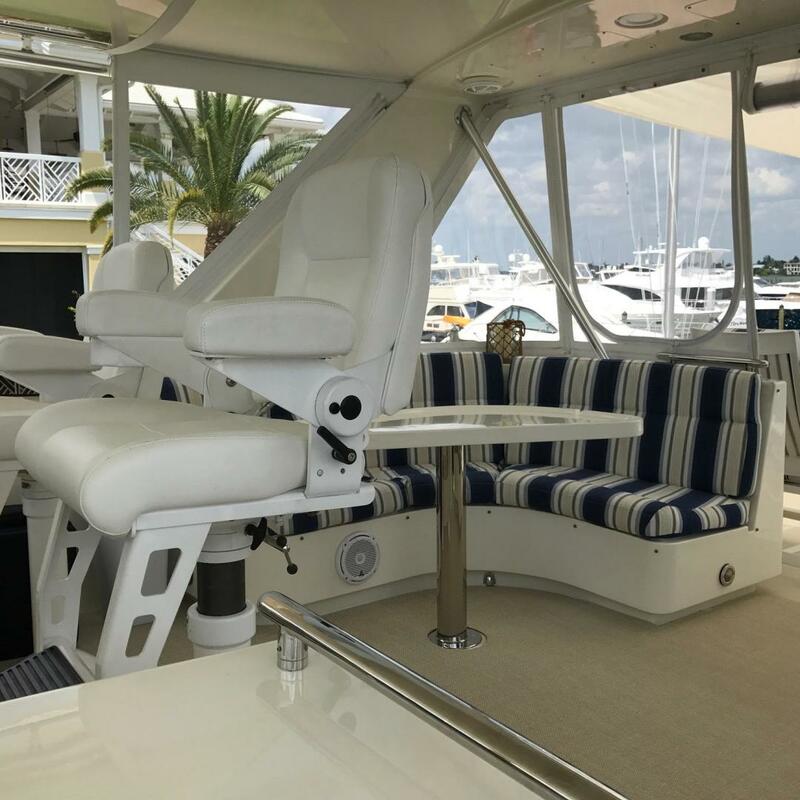 The flybridge is a great place for entertaining guests protected by a composite hardtop molded to the radar arch. 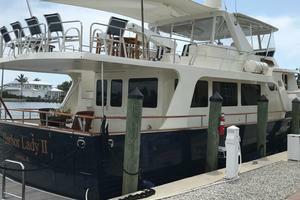 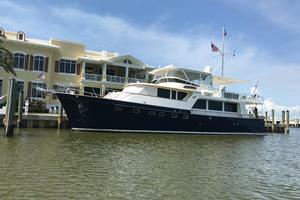 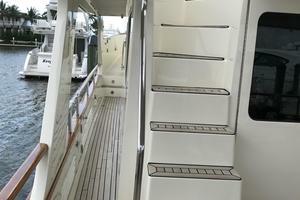 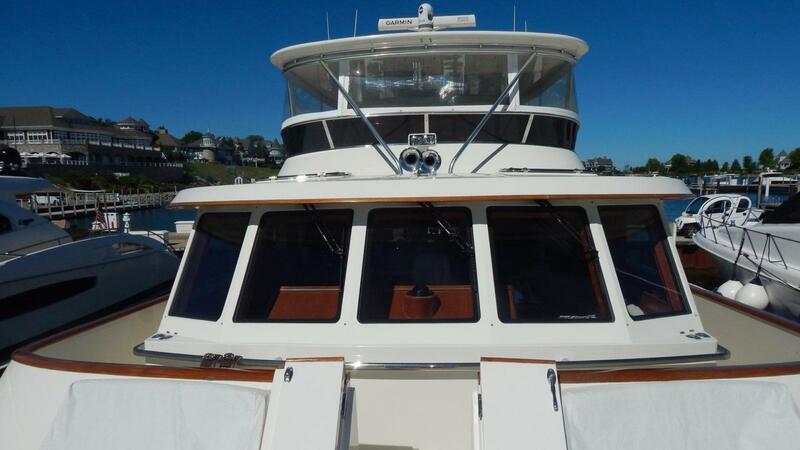 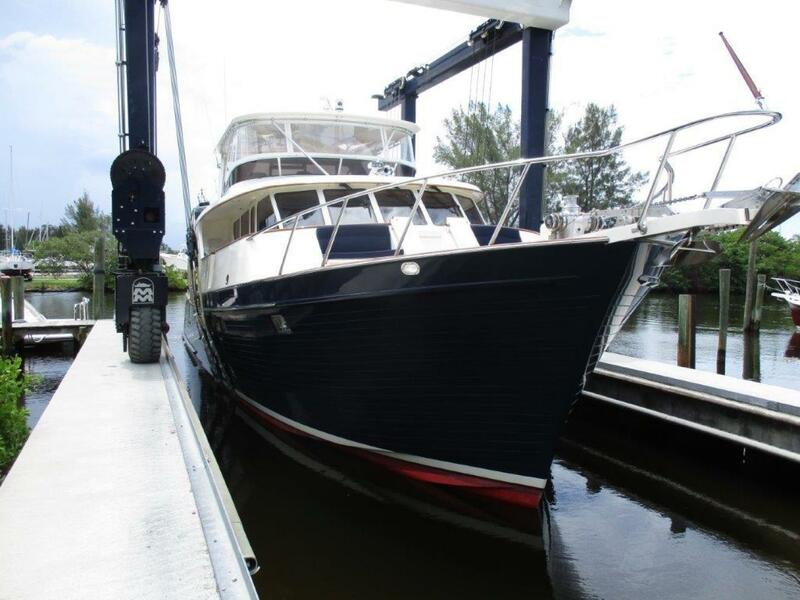 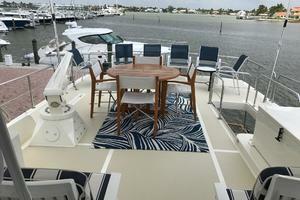 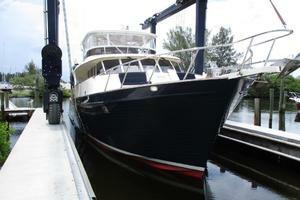 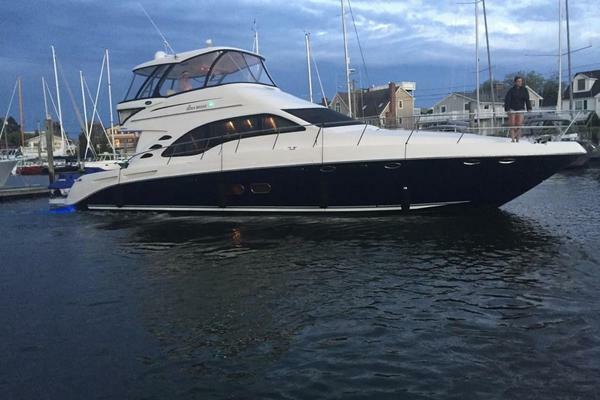 The flybridge is accessible by stairs from the wheelhouse and the aft deck. 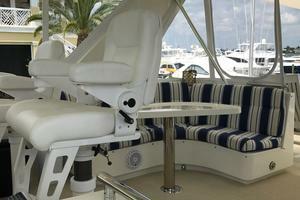 There is comfortable seating for a dozen people, with two serving tables and two Stidd helm chairs. 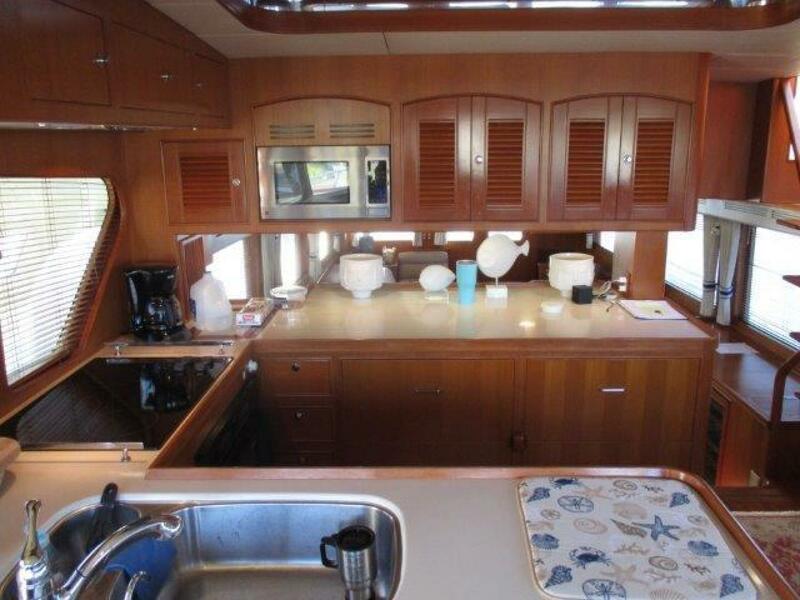 There is a sink, U-line combo refrigerator, and plenty of storage with Stamoid seat covers. 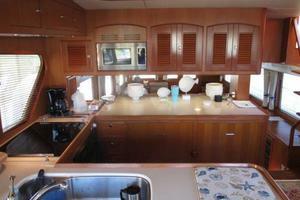 Two berths, full height head and shower, hanging locker, storage drawers (2), and additional storage. 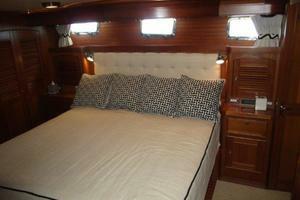 Both berths have very nice color coordinated bedspreads. 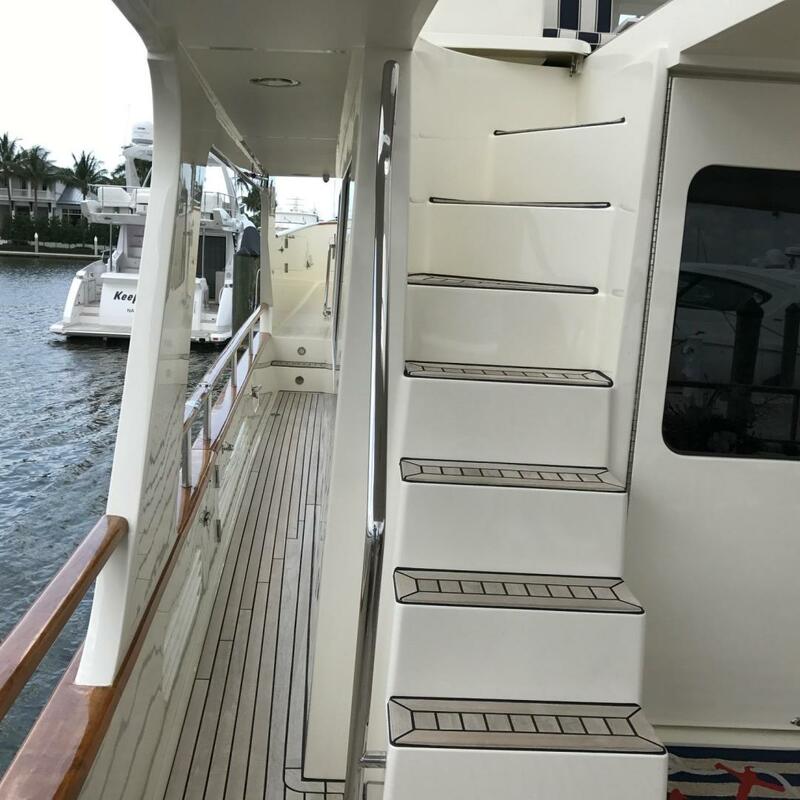 In 2016 Harbor Lady II went through a full survey "punch list" and installed all new soft goods by Marlow Marine.